Found on America, History, America Live, America's Gold, Live In Central Park, America In Concert (85), The Very Best Of America, America In Concert (95), Horse With No Name, You Can Do Magic, Premium Gold Collection, Centenary Collection, Greatest Hits, Live, Highway, Hits You Remember Live, The Definitive America, The Complete Greatest Hits, The Grand Cayman Concert, and Here & Now. The America album was released in Britain to moderate response. 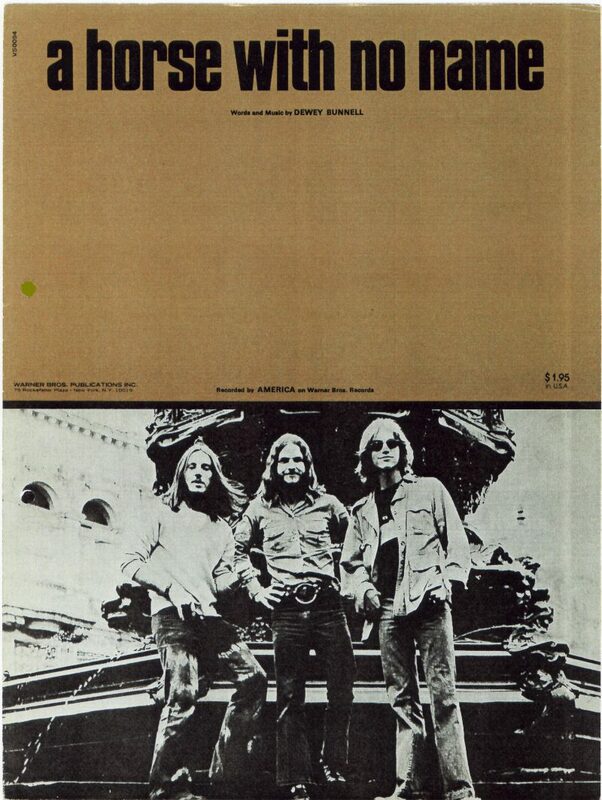 Though "I Need You" was discussed as an initial single, Warner Bros. asked the band to come up with another song that would break them on the radio. So, five months after the album came out, they went into a small London studio and demoed four new tunes. Among them was an enigmatic Bunnell number with a catchy rhythm that was initially called "Desert Song." Much to the band's surprise, that was the song that Warners chose to release. The band went into Morgan Sound Studios (where Beckley had played bass on demo sessions a few years before) to record the song, with Samwell producing and Kim Haworth brought in on drums. At Samwell's suggestion, "Desert Song" was retitled "A Horse With No Name." A tune as famous as this one deserves a detailed explanation, though Bunnell suggests that its meaning has evolved over time: "I was messing around with some open tunings--I tuned the A string way down to an E, and I found this little chord, and I just moved my two fingers back and forth, and the entire song came from basically three chords. I wanted to capture the imagery of the desert, because I was sitting in this room in England, and it was rainy. The rain was starting to get to us, and I wanted to capture the desert and the heat and the dryness." The imagery came from Dewey's childhood: "I had spent a good deal of time poking around in the high desert with my brother when we lived at Vandenberg Air Force Base [in California]. And we'd drive through Arizona and New Mexico. I loved the cactus and the heat. I was trying to capture the sights and sounds of the desert, and there was an environmental message at the end. But it's grown to mean more for me. I see now that this anonymous horse was a vehicle to get me away from all the confusion and chaos of life to a peaceful, quiet place." Bunnell adds an aside about his choice of language in the song: "I have taken a lot of poetic license in my use of grammar, and I always cringe a little bit at my use of 'aint's,' like 'ain't no one for to give you no pain' in "Horse." I've never actually spoken that way, but I think it conveys a certain honesty when you're not picking and choosing your words, and you use that kind of colloquialism." "A Horse With No Name" broke more than the rules of English--it broke America as a major recording act in Britain, the U.S., and Europe. After reaching #3 in the U.K., it was released in the States, where it topped the Pop chart for three weeks in March/April 1972. It stirred some controversy--stations in Kansas City and elsewhere banned the song for supposed drug references ("horse" being a street name for heroin at the time). The song's resemblance to Neil Young's work stirred some grumbling as well. 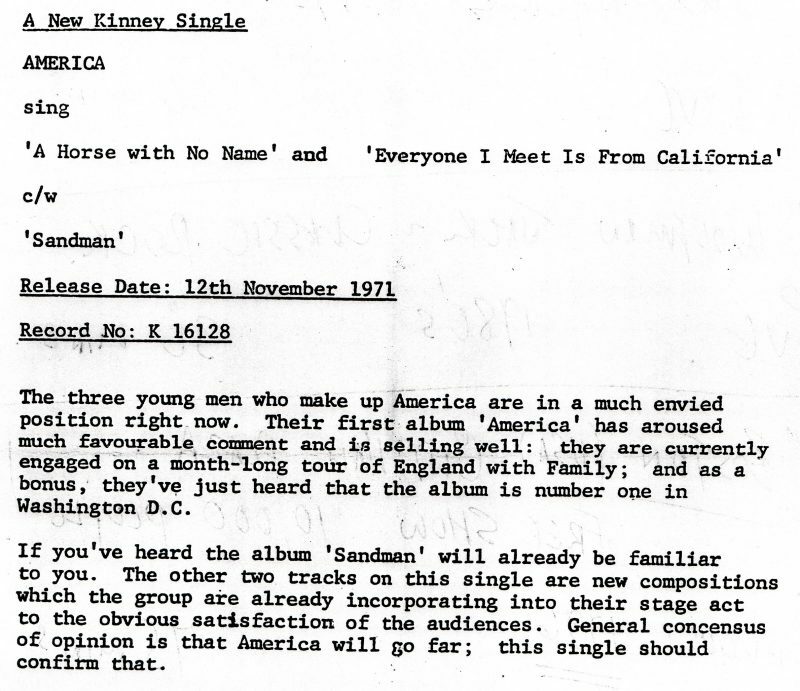 Coincidentally or not, it was "A Horse With No Name" that bumped Young's "Heart Of Gold" out of the #1 slot on the U.S. Pop chart. "I know that virtually everyone, on first hearing, assumed it was Neil," Bunnell says. "I never fully shied away from the fact that I was inspired by him. I think it's in the structure of the song as much as in the town of my voice. It did hurt a little, because we got some pretty bad backlash. I've always attributed it more to people protecting their own heroes more than attacking me."